We knew it was going to be big, but nobody could have imagined just how big the 5th anniversary Sunday Million poker tournament would become this past Sunday at PokerStars. The Sunday Million typically guarantees $1.5 million, and the average first-place prize-money is generally around $200,000: For the anniversary tournament PokerStars was guaranteeing $5 million, with the winner receiving at least $1 million. In the end, all of the guarantees were for naught as the tournament far surpassed its guarantees, and set all kinds of online poker records. To reach its guarantee the $215 buy-in tournament would need about 23,000 entrants, and to surpass the 4th anniversary tournament of a year ago the tournament would need to surpass the record-setting 36,119 entrants that turned out for that tournament. After drawing some 59,128 entrants, the 5th anniversary Sunday Million was no longer competing with last year’s tournament, but was now in the same league as the WCOOP Main Event in terms of overall prize-pool, and the Guinness Book of World Record’s tournament –that sported a $1 buy-in—in terms of entrants. 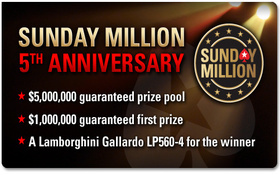 On both fronts this weekend’s past Sunday Million ended up in 2nd place. After an unprecedented 9-player deal at the final table, that saw each player receive at least $263k –with the biggest payday going to the3rd place finisher wrzr123 at $844k—leaving only the Lamborghini Gallardo to play for; as well as their name going down in history as the winner of one of online poker’s biggest tournaments of all-time. This entry was posted on Tuesday, March 8th, 2011 at 5:09 am and is filed under Poker News. You can follow any responses to this entry through the RSS 2.0 feed. You can leave a response, or trackback from your own site.